Reflections of a Newsosaur: Don’t know about Aardvark? You should. Q. Why did Google buy Aardvark for a reported $50 million? A. Because the highly addictive social network is a nearly perfect multi-platform, interactive ecosystem. As such, it sets the standard – for the moment, at least – for interactive publishing. If you want to understand the evolution of the media, you need to see it and use it. Then, try to figure out how it applies to your business. Google bought the young company to learn from it – and to be sure that no one else got it first. A. Aardvark is a free service – whose URL is Vark.Com – that lets you ask a question on the web or your iPhone in natural language, as opposed to key words. Most queries are answered remarkably fast and remarkably well by fellow users. Barely two years old, the service had 90,361 users in October, 2009. Its web traffic has dropped since then, but the drop coincides with the launch of its free iPhone app, which the Silicon Valley company says is more popular than its website. Non-expert users can peruse the latest questions and answer them, too. For example, I was able to point someone to the State Department website that tells you how long you have to wait for a passport to be issued. If you are curious about the answer to a question that someone else has asked, you can tell Aardvark to send the answer to you when it comes in. Users also can tell Aardvark to send them future answers to questions in their areas of interest. Q. What kind of questions do people ask? A. 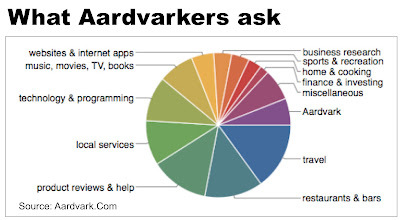 As you can see from the pie chart below provided by Aardvark, the queries tend to be seeking recommendations for restaurants, products, services and travel. A large number of queries deal with computer programming and problems. Q. Why do you say it is addictive? Q. Are there more questions or more answers? A. Interestingly, the average Aardvarker asks 2.5 questions but answers 4.3 questions, according to the company. A. There isn’t one yet, but Google will take care of that in due course. This sounds a lot like WikiAnswers or WikiCity Guides, which does the same on a local scale. WikiAnswers recently eclipsed Yahoo Answers as the largest Q&A site in the world. Why wouldn't Google grab their audience instead of Ardvark? Sure Ardvark is cool, but $50 million seems like a high price to pay for someone else's web development technology - especially if the buyer (GOOG) is (arguably) the most progressive web development companies that ever existed. How does this compare to 'Cha-Cha', which is another mobile-based question/expert reply service? Well, I tried signing up, but it informed me that it only sends questions and answers by IM. That's fine as an option, but to make it a requirement means that Aardvark is dead on arrival in my book. Anyone who is busy has to be able to time-defer something like this, and that's not easily done with IM. I may try it again if they decide to open it up to other forms of communication. 1) The lack of a revenue plan is worrying. Google has not been able to diversify beyond advertising for generating revenue (I believe 97% of Google's revenue comes from AdSense and other ad services) and very few publishers who use Google's advertising services are able to reach sufficient scale to make a profit. 2) Google has a poor track record with its other big expert-driven knowledge service, Knol. I'll give Aardvark a try, but I am skeptical. Alan: These aren't experts - they are amateurs who claim to be experts. Big dif. There are dozens of sites like this, mostly specializing in an area - medical, tech, etc. And, as always, the lack of a revenue model. Why is it that no one sees this second tech bubble with so many companies with no revenue garnering huge pricetags? Must be nice to be Google and have millions to waste. The revenue model might be the marketing data culled from the questions and askers of questions. Google CEO Eric Schmidt recently wrote on op-ed in the Wall Street Journal about the new world of electronic journalism and how targeted advertising based on surfing habits and story interest would rule the day. Well, I tried signing up, but it informed me that it only sends questions and answers by IM..."
You can answer online. I signed up and didn't enter an IM option.